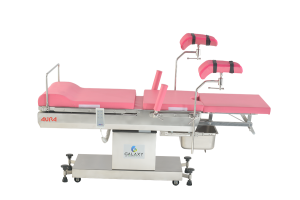 Specially designed Electric Obstetric Table suitable for Gynaecological diagnosis and examination, child-birth, ceasarian operation and other gynaecological surgical operations. Three Section upholstered tabletop ensures maximum comfort to the patient. Operating positions i.e. 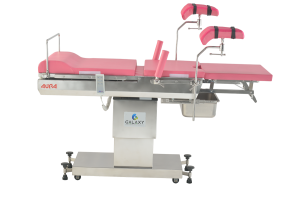 Height adjustment, Trendelenburg, Reverse Trendelenburg and Back Section are precisely and smoothly controlled by cabled handheld Remote using Imported Linear Actuators with very low noise level. A low voltage system is used to ensure safety of the user. The remote is ergonomically designed with symbolic position figures making it simple to use. The new futuristic design SMPS Control Box with microprocessor based software system for functionality. 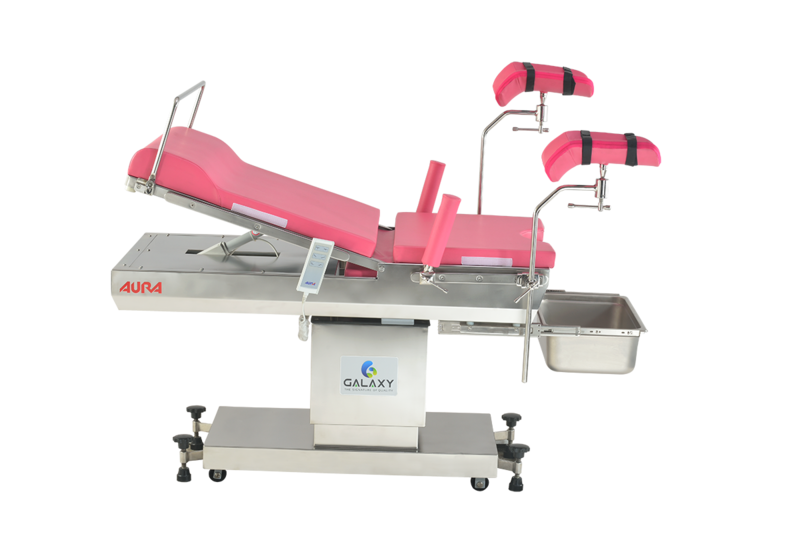 Leg section can be completely slid-in under the middle section for lithotomy position or slid-out to transform into full-length table as per delivery requirement. Large size Stainless Steel Douche Tray with ball bearing slides for easy movement. Specially designed Handrail on head side of the table helps pregnant woman parturition smooth as well as acts as a pulling handle while moving the table. Maintenance Free Lifting System: State-of-the-art lifting system comprising of hi-precision bearings with large contact surface which ensures the highest rigidity for heavy loads and smooth up-down movement. All bearings are permanently grease lubricated thus making this lifting system virtually maintenance free for lifetime. The table has an aesthetically beautiful bodyline and is fully covered with non-corrosive, mat finish SS304 Grade Stainless Steel for easy cleaning and hygiene. 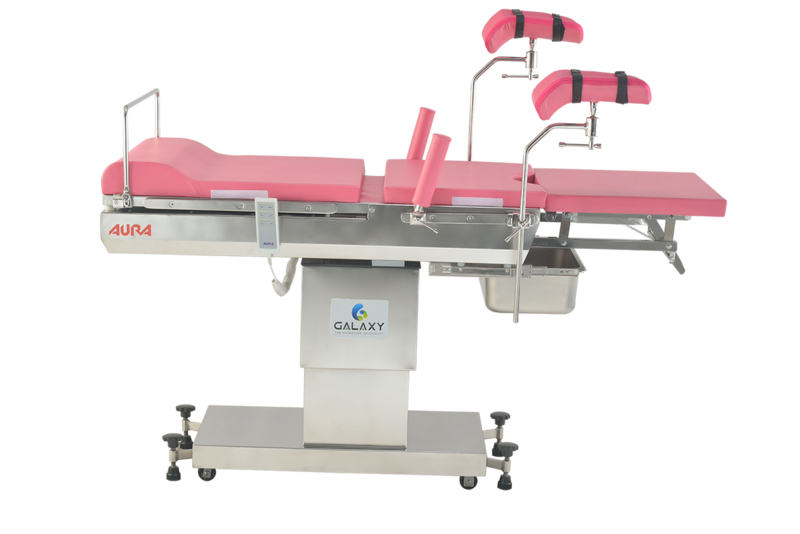 Complete with SS304 Grade Stainless Steel side-rails, clamps and standard accessories.